The Greater Yellowstone Ecosystem (GYE) is a stronghold for wildlife and encompasses over 18 million acres. The GYE occupies parts of Montana, Wyoming and Idaho and includes Yellowstone and Grand Teton national parks, portions of six surrounding national forests, three national wildlife refuges, and private lands. The GYE is considered one of the last intact temperate ecosystems on earth. Last year while visiting Grand Teton National Park, we listened to one of the park rangers talk about whitebark pine. The ranger talked about how the tree is a critical part of the West’s high elevation habitats because it provides food for many different birds and animals in the GYE. The slow growing whitebark pine can live for hundreds of years in the West’s harsh subalpine environments, but it cannot survive disease, bugs and climate change. So why would this tree be of any interest on anyone? Grizzly bears have been in the news a lot lately and whitebark pine nuts are the most important plant food eaten by grizzly bears. When pine nuts are abundant, bears tend to be in the high elevation areas where whitebark pines grow and so the bears are far away from human development and conflict. The average adult female grizzly bear can gain as much as five pounds per day when feeding on pine nuts. 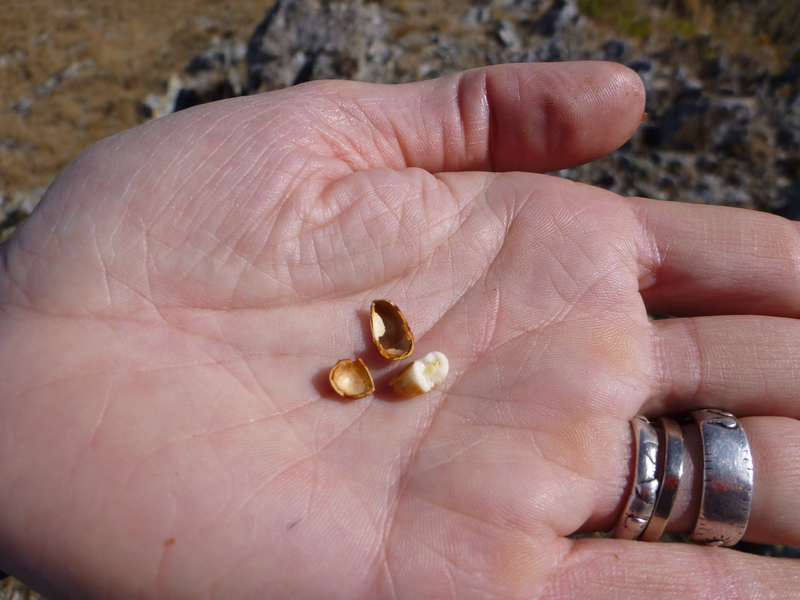 These nuts are 28% fat, which is important to bears who need to store up fat for winter’s hibernation. A few weeks ago, we drove up to Schoolhouse Ridge. A scenic spot along the Continental Divide separating Idaho and Montana at 8200 feet. A beautiful stand of whitebark pine glistened in the sunlight. I found a pine cone on the ground below the tree and examined it. 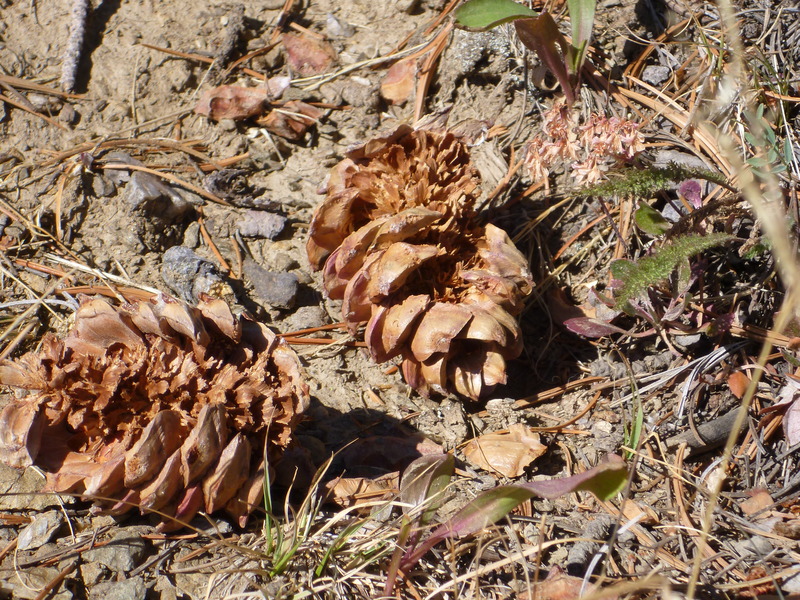 After picking at it carefully, I was excited to find a single pine nut left in the cone. I can’t imagine what a grizzly must go through to eat these. On July 18, 2011, the U.S. Fish and Wildlife Service announced that the tree was in such widespread decline that it deserved a place on the endangered species list. 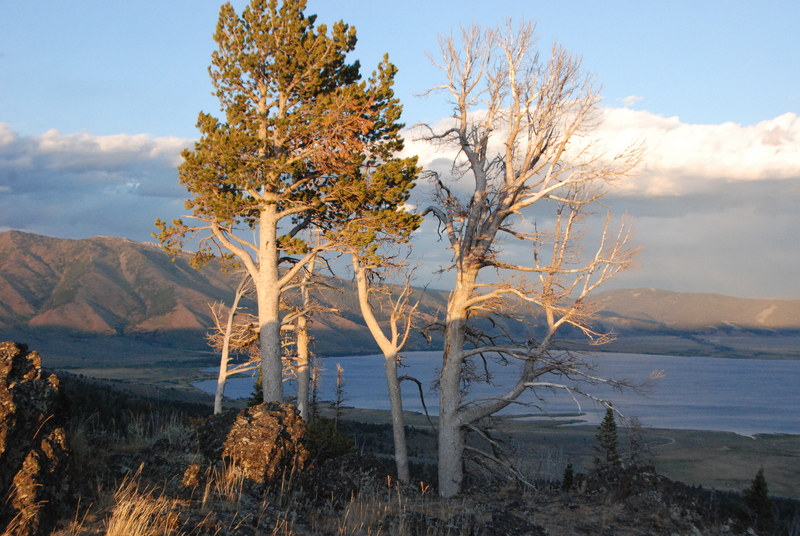 A recent study found that 46% of whitebark pine forests in the GYE are dead or dying. Due to unavailable funding and resources instead it was designated a candidate species. Next year, they will review it again. Hopefully, it won’t be too late.